This collection of 12 sheets of quality standard-size (500 x 700mm) gift wrap features Art Deco designs from the Victoria and Albert Museum, London. 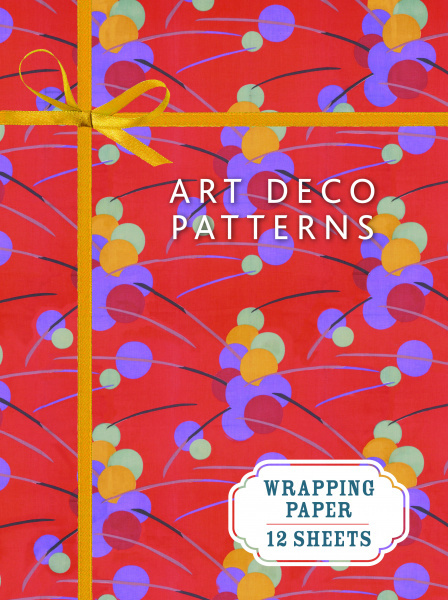 The wrapping paper is folded into a paperback book, which has a note-pad binding for a clean, easy-tear off. The Deco period began in 1910 when Art Nouveau slid out of fashion. Its highpoint was in 1925 at the Paris exhibition, the Exposition Internationale des Arts Decoratifs et Industriels Modernes, and the style culminated at the New York World’s Fair in 1939. Art Deco brought an exotic, vibrant style to the most precious and exclusive works of art as well as to mass produced objects which were widely available. It became a universal phenomenon transforming the look of everything from factories and cinemas to fashion and photography. Art Deco is arguably the most popular style of the last century and one that has enormous appeal for people all over the world today. The Victoria and Albert Museum, London, houses a permanent collection of over 4.5 million objects.Over 3.7 million visitors visit the V&A's various sites.